No one was injured this morning following two water rescues at California Crossing Road near Wildwood Drive in northwest Dallas. It's a known trouble-spot that floods often during heavy rain; yet drivers continue to ignore warning signs and drive around barricades. The consequence-- cars swept away or submerged by rising flood waters. It seems to happen every time there’s a torrential rain and flash flooding. Two drivers got stuck on California Crossing on Wednesday morning, one driver was trying to rescue the other. 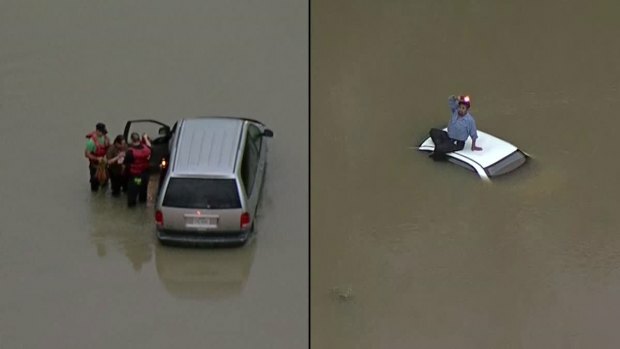 He stood on top of his submerged vehicle, waving frantically at Chopper 5 flying overhead. Dallas Firefighters rescued him. City Emergency Managers watch these scenes unfold with frustration. The area has warning signs and flashing lights in place. "Those are up for a reason, they’re up to protect and separate hazards from citizens. If you come across a barrier don’t drive around it for conveniences sake," said Assistant Emergency Management Coordinator Kevin Oden. Dallas emergency managers keep a close eye on about 40 flood-prone roadways that have "Flooded Roadway Warning Systems" in place. When water crosses the roadway and driving conditions become too dangerous, the lights start flashing on the warning signs posted on the side of the road. A Dallas Streets Services worker, police officer, or Office of Emergency Management employee would have to physically come to the site, though, to put up temporary barricades or close the gates if flooding gets worse. "We actively look for mitigating opportunities to stop flooded roadways," Oden said, "and actually we’re working with the Federal Emergency Management Agency right now as a result of the Memorial Day floods in 2015, to get some mitigation funds to help alleviate these problems." Northwest Dallas tends to have some of the most dangerous flooding. "The heaviest street flooding that we had in the city is in that part of town. That area would certainly be an area to look at for any mitigation we can do," Oden said. Federal flood-assistance money could go towards more flashing lights and warning signs; barricades; and elevating certain roadways. "It does happen, drivers do go around flashing warning signs," Oden said. "And it’s just a reminder for us to push that message out in every available medium we have available to us." Several people were rescued without injury Wednesday morning after being stranded in high water at California Crossing Road near Wildwood Drive in northwest Dallas. It's a known trouble-spot that floods often during heavy rain, yet drivers continue to ignore warning signs and drive around barricades. The consequence -- cars swept away or submerged by rising flood waters. It seems to happen every time there’s a torrential rain and flash flooding. High water in Dallas led to some dangerous moments for drivers in Dallas Wednesday morning. A Dallas Streets Services worker, police officer or Office of Emergency Management employee would have to physically come to the site, though, to put up temporary barricades or close the gates if flooding gets worse. "We actively look for mitigating opportunities to stop flooded roadways," Oden said. "And actually, we’re working with the Federal Emergency Management Agency right now as a result of the Memorial Day floods in 2015, to get some mitigation funds to help alleviate these problems." Federal flood-assistance money could go towards more flashing lights, warning signs, barricades and elevating certain roadways.